And I thought I was in Taichung to meet the Babuzas, the Taiwanese aboriginal earliest settlers, and to kneel in the temple of Wen Chnag , the Scholar God, and seek wisdom. In Taiwan’s third largest city, I thought I’d loll in the greens of the century-old Taichung Park, and in National Taiwan Museum of Fine Arts will steal the sky from the curled up sculpted girl who is called The Cloud Who Calls the Sky Her Own. Instead, I picked up the rolling pin, pulled a white chair, eyed the buttery dough and waited for the podgy pastry chef Chen Sun Chan to rattle off instructions to roll the sun cake, Taiwan ’s most famous cake pastry. Chan adjusted his white cap, stringed the apron, I held the rolling pin. However, instead of flattening the dough to roll the essential 96 layers, I was flustered. Chan was speaking Mandarin at breakneck speed and I sat stoned lamenting my inability to follow the recipe of the 112-year old Pao Chung Food Industry, perhaps the most famous sun cake makers in Taiwan . Thankfully, Francis Hu, the local guide, came to my rescue. Then, I faltered, fumbled, messed up the pastry dough. But Chan was generously forgiving and I finally rolled the sun cake, the pastry which was first made by the Lin family in Taichung . Ten minutes later, when Chan pulled the cake from the oven, it was flaky to the 96 th layer, mildly sweet and hot as hell. What if I missed seeing the Confucius Temple , I picked the ancient art of sun cake making. I puffed with pride. From sun cake to whale watching, my Taiwan itinerary was getting fascinating with each passing mile, miles lush with water bamboo and grapevines snaking with gay abandon; red dragonflies that flitted with joy and rose-flavoured bananas that hung precariously from strings in roadside kiosks. To step into Gueishan Island that is located off the coast of Yilan County, I had packed my passport because it is mandatory for foreigners to apply in advance and carry their passport. That. however, was not all that I packed – there was a bucket of sunscreen, a broad-rimmed straw hat and mammoth hair clip to prevent my long hair from flying in the gusty sea breeze. Tourists were swarming at the harbor where white motorized boats were revving their engines to head to Gueishan Island , which is one of the three largest fishing grounds in Taiwan . It is the bountiful food along the Kuroshio Current that brings countless dolphins and whales to the Gueishan Oceanic area. I slathered sunscreen, wore an orange life vest and stood by the deck as the boat slid on the choppy sea. I muttered a prayer for the whales to swim by – they are unpredictable, one never knows which way the whales will go. I peered hard into the blue sea to catch a glimpse of the whales. I peered harder, but that day the whales were gamboling elsewhere and I saw none. But there was a mound of brown that compensated for the no-whale sighting. The volcanic island of Gueishan (literally Turtle Mountain in Mandarin) looks like a giant turtle on the sea. Barely 2.85 sq.kms long, Turtle Island is pristine in its beauty. Adding intrigue to the beauty are the yellow sulfur springs that well from the sea’s womb and mingle with the turquoise blue of the sea water. Disappointed, I left behind the turtle and got engrossed in the legend of the white deer that led the Thao tribe hunters to the Sun Moon Lake, Taiwan’s largest water body and perhaps the favorite haunt of honeymooning couples. In older English literature, the lake is referred to as Lake Candidius after the 17 th century Dutch missionary Georgius Candidius; during the Japanese colonial era, it was known as Jade Island . But I shunned all semantics. Mist was rising from the mountains, a series of gig lamps were shining in the far-off pagoda and red lanterns were adding iridescence to a grey evening. I stood on the wooden deck of The Lalu Hotel and stared at what seemed painted by a deft artist. I was determined to stand and stare all night, till Noel Saxena, Country Head, Taiwan Tourism Bureau representation office in India , interrupted my reverie. Taipei was waiting to be discovered. In Taipei , Taiwan ’s capital, I hopped across the Feng Sui fountain and the red Love sign to the world’s tallest built skyscraper. I could have huffed 2,046 steps up the Taipei 101, instead I took the world’s fastest elevator. Whoosh! In one minute it does 1,010 metres! In 39 seconds I reached the 88 th floor observatory from where I saw the city sprawled in the Taipei Basin . I was so close to the clouds but where were the angels? Lazy on a muggy afternoon? I missed seeing them but in the haze below I could identify the black roof of Dr Sun Yat Sen Memorial, the Father of the Nation. On the 88 th floor, more colours fell my way – natural corals in burnished orange and emerald green stringed as pendants and crafted as dainty rosettes, stalactites perched on veneered oak frames and pebbles embellished with hand-painted squiggles. In Taiwan , corals and jade are everywhere. Almost everywhere. In Taipei, I had assiduously lined up the foodie’s to-do list that included the imperial banquet at Silks Palace, Din Tai Fung, the xiaolongbao (steamed dim sum) restaurant that was rated by The New York Times among the top 10 restaurants in the world and – hold your breath – the Modern Toilet, a restaurant where lights are shaped like poop, curry is served on toilet-shaped plates, drinks come in plastic urinals, painted WC lids hang on the walls, a bath tub serves as a table and sorry, no chairs. Everyone sits on stylish acrylic pots. Yes, with the lid down. Not to forget the night markets where food can be as bizarre as your palate can afford to. I, however, chose to pull a string. 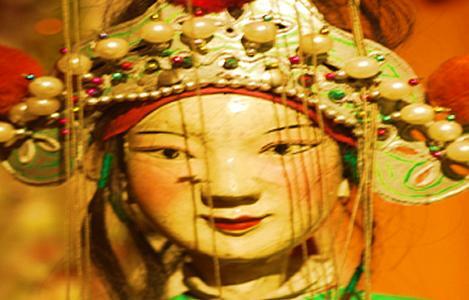 A real string in Lin Liu-Hsin Puppet Theatre Museum . I picked a quick puppetry lesson from Dr Robin Ruizendaal and tried the puppet act. In Taiwan , I was as duff as a puppeteer as I was as pastry chef. But I’ll go to Taiwan again. Next time, I will roll the sun cake dough round. I will pull the marionette string perfectly. Just you wait!